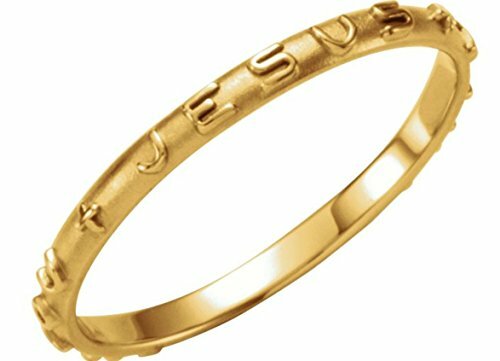 Slim profile ring with raised text 'Jesus I Trust In You' prayer shown, wrap around your finger to remind you at all times to lift up your heart to God and pray always, as the Bible tells us to do. It is fitting this is crafted of gold; it's said spiritual energy and power are activated and awakened by wearing or praying with gold. Gold represents the spiritual treasure gained by transforming the spirit; it also represents love in the Bible. This is earth friendly as it is made with the Refined Karats system certified by Scientific Certification Systems' (SCS) strict requirements. Proudly made in America with a green process of ethically, environmentally and socially responsible production processes of water, waste and energy management; this is from 100 percent recycled Karats. Diamond Dove Pendant Necklace in 925 Silver (0.08cttw, IJ / I2-I3) 18"